Take a closer look at the people and places that contribute to West Chester’s special character. For eight years, the West Chester Downtown Foundation has been celebrating the preservation of West Chester’s historic character with its West Chester Historic Preservation Awards Program. These efforts have contributed to the Borough being nationally recognized for its efforts to preserve its heritage. Residents and visitors to this charming Chester County town see evidence of this important work and commitment. Awards are made for a variety of contributions to preserving the historic fabric of West Chester. This year, for the first time, a private property owner’s effort to preserve—at least in part—the historic landscape of the Borough was recognized with one of the five Bricks and Mortar Awards made at the awards ceremony on October 18, 2018. Bricks and Mortar Awards recognize different types of construction projects of sterling quality that demonstrate the creative ways that buildings can be preserved, restored or rehabilitated. 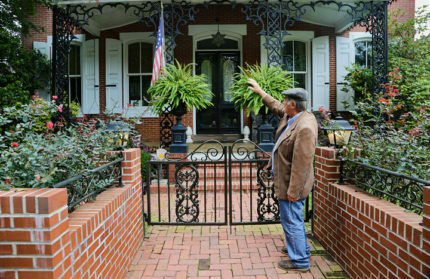 Perhaps one of the most iconic and well-known sites in West Chester, at the corner of High and Gay Streets, is the location of the first winner. 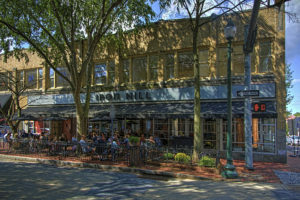 Iron Hill Brewery (3 West Gay Street) won for the 1998 adaptive reuse of the c. 1920 Woolworth’s Building, converting it into a restaurant and micro-brewery. The project included dividing the original retail space into three different areas for a restaurant, bar and micro-brewery. This project clearly illustrates the benefits to West Chester’s historic fabric of carefully adapting historic resources to new uses. Another winner is also a site that many in West Chester have seen, or maybe even visited. 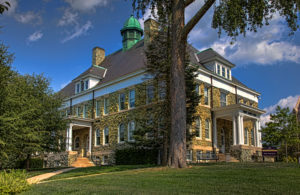 Ruby Jones Hall (50 University Avenue) was selected for the successful long-term rehabilitation of the old Demonstration School Building into a classroom and office building known as Ruby Jones Hall. The rehabilitation of this property included façade repairs, foundation damp-proofing, porch roof restoration, and HVAC systems upgrades to connect with the recent campus-wide geo-thermal system at West Chester University. This project demonstrates that careful rehabilitations can retain the historic fabric of older buildings, while still allowing active use. 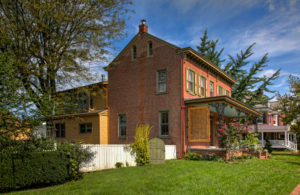 The Dower House and Chimney Hill Residences (100–102 Goshen Road) received an award in recognition of the Dower House owner’s efforts to preserve the historic landscape of the northern entrance into West Chester by subdividing the property into two lots, rather than four, and in recognition of the Chimney Hill owners’ efforts to insert a new house in a way that preserved the illusion of open space. The Biddle Guest House (519 North High Street) was recognized as a good example of how sensitive additions can enhance historic houses and still meet the needs of modern families. The back of this house had been burdened with an addition built in an incompatible style. In 2017, that addition was replaced with a garden room designed at a compatible scale and that used materials and architectural details found throughout the main house. As a bonus, the new addition gives direct access to the garden and allows light into the interior of the house. The c. 1870 House (401 West Union Street) won for the superb restoration done by its current owners. 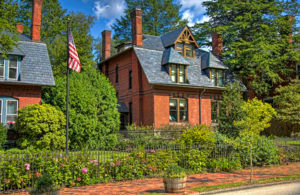 Over the past 18 years, using historic photographs of their house, the owners have carefully restored the exterior, including the house’s wooden architectural elements and the cast iron porch supports and decorative elements, along with the exterior of the carriage house. This project is a highly visible showcase of exceptional restoration efforts. In addition to the five winners of Bricks and Mortar Awards, two outstanding citizens of West Chester were recognized with individual awards. Kay “Kate” Eby Moore was posthumously presented with a Special Recognition Award for her early advocacy for preserving West Chester’s historic resources. Kay was best known as the creator of West Chester’s highly successful Old Fashioned Christmas celebration, including its award-wining Christmas Parade. The 2018 Preservation Legacy Award went to Thomas M. Walsh in recognition of his efforts to educate the public about West Chester’s history. His work has been critical in establishing community support for preserving the Borough’s historic character, including chairing the predecessor to the Historical and Architectural Review Board. The 9th Annual Preservation Awards will kick-off when nominations open in April (the deadline is in June). Nomination forms and rules are available at the West Chester BID office or on-line at DowntownWestChester.com. Winners will be announced in July, with the Awards Ceremony scheduled for October 17, 2019. Please help recognize projects that have enhanced West Chester’s historic character and integrity by submitting a nomination and be part of this important process!